Are you trying to prove yourself through productivity? Are you addicted to being busy, somehow convinced that your worth is connected to how much you get done? Today, Kate Northrup joins me to explain how to tap into the natural rhythms that are already a part of you and achieve more—by doing less! In this episode Daring to Rest founder Karen Brody chats from her rest cave about the rest cure, an immensely popular method used on women in the middle and upper classes in the late 1800s in American and Europe who were mysteriously getting sick. Find out why this period in history is important and what women can learn from it to help us take back rest today. Perhaps you’re considering enrolling in the Daring to Rest Academy, but you want to know more about what to expect. Today, Melissa Barnet, Jo Blackman, Cheri Brown and Barbara Dopfer share their experience as part of Tribe 2 and explain how they are bringing the gift of yoga nidra “sleep” meditation to the world. We know that being well-rested improves the quality of our lives because we can FEEL it. But what if more women measured the impact of practices like yoga nidra? Today, Dr. Nicole Bowman joins me to share the system she used to track Daring to Rest yoga nidra’s effect on her health and productivity. What happens when you lose your sleep? In this episode I introduce you to Laurissa Wieler, who lost her sleep twenty years ago and today is channeling her musings on sleep into a whimsical bedtime stories book for women who can’t sleep. In this episode, Laurissa treats us to three of her stories from the book she’s working on, Bedtime Stories for Women Who Can't Sleep at Night; Tales and Musings for the "Awakened' Woman. 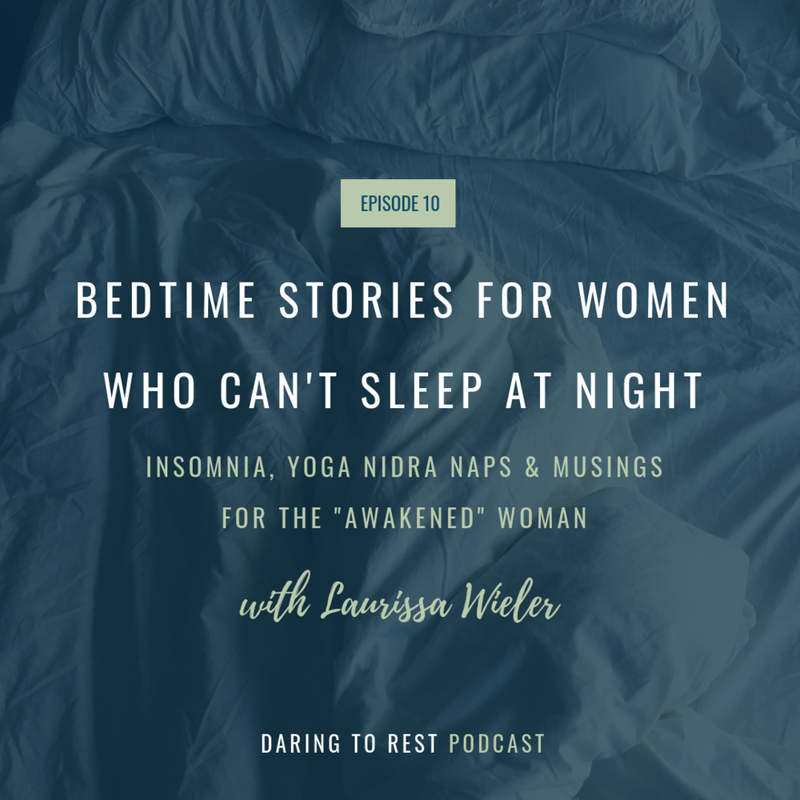 Join us as we talk about insomnia, the impact of yoga nidra naps on Laurissa’s life, and the multi-layered themes within her beautiful stories that speak to the heart of women’s real lives. Laurissa is also a trained Daring to Rest facilitator, teaching women Daring to Rest yoga nidra in her community in British Columbia, Canada. As always, I’d love to here your comments on this podcast below. Here’s to Daring to Rest and the rise of the well-rested woman. Whoa…Sometimes a book shows up just when you need it. I rarely watch the news. I know it makes me feel horrible, but for several weeks over the past month I felt sucked into watching news that broke my heart. Every night, another chapter would unfold on the screen, causing more exhaustion. News replaced my morning yoga nidra meditation for the first week - that’s how much I was caught up in the hypnotic pull of the news. And then Judith Orloff’s book, The Empath’s Survival Guide, showed up and I was reminded of something I already know - that I’m an empath and I need to protect myself. In fact, when the news is so crazy, this is exactly when we need to be UPing all our heart tools, like yoga nidra, not sitting in front of the news drowning our hearts in the pain of the day. current news and how not to feel so exhausted and anxious. “You are stronger than anything that’s happening now,” Judith tells us. “Don’t see yourself as a victim." We can thrive in our lives, women - protection strategies are out there and in this episode Judith offers a ton of them. If you’ve ever been called “too sensitive” and if you’re looking for concrete tools to navigate modern life, then make yourself something calm to drink, and lean back, and listen. Tired? Overwhelmed? This is your episode. Join Karen as she talks with Kerry Magnus and Janis Wheeler, two women who have practiced the Daring to Rest 40-Day program with profound results. Learn about the key features of Daring to Rest - from soul whispers to the Council of Women - and how a continuous practice helps you embrace pain, have compassion for yourself, step into your truth, and feel as though the universe has your back...in an easy way that doesn't involve doing and thinking...just resting. Make a cup of tea, lay back and join us. In this episode, meet Dr. Rubin Naiman, a sleep and dream specialist who says people are at least as dream deprived as they are sleep deprived. Learn what dreaming well is and how not dreaming can impact your health. Also, find out who the three women Dr. Naiman would love to have tea with and why. Dr. Naiman's book Healing Night is my absolute favorite book - it's a must read for anyone who wants to really understand rest and why we don't sleep from a psycho-spiritual perspective. I've interviewed him before and I'm always learning something new. I think you will too. He's definitely my rest-crush :) I can't wait for you to meet him. And, if you'd like to meet him in person, consider attending his Healing Insomnia workshop next month in California.